Description: In paper the choice procedure of service mode of measuring monitoring techniques (MMT) in systems with increased requirements to readiness is considered. Two basic service modes of MMT are considered: with usage of an exchange store of MMT and service of MMT by mobile operation elements in places of operation MMT. The procedure of a technological estimation of service modes MMT is proposal. Morozov, A.A. and Chernov, A.B. 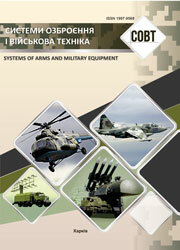 (2007), “Vybir sposobu obsluhovuvannia zasobiv vymiriuvalnoho kontroliu dlia system z pidvyshchenymy vymohamy do hotovnosti”, Systems of Arms and Military Equipment, No. 1(9), pp. 50-52.